Heads, right? 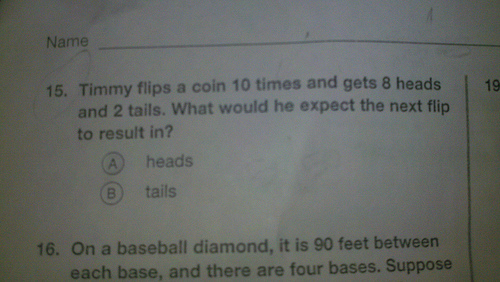 The question didn’t say it was a fair coin. Note that it doesn’t say “what should he expect.” He shouldn’t have any expectations, but if he subscribes to the gambler’s fallacy, then he would expect tails. Unless he believes in streaks, or doesn’t believe it’s a fair coin, as George mentioned, in which case, he might expect heads. So…I don’t know which answer is correct, but the fact that there’s only two answers suggests that Timmy’s an idiot.